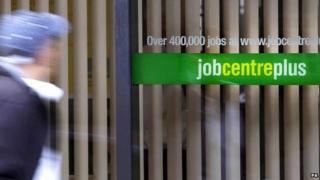 UK unemployment has fallen by 102,000 to 1.86 million in the three months to January, official figures show. The unemployment rate remains at 5.7% but the number of people in work is at an all-time high, the Office for National Statistics (ONS) said. The number of people claiming Jobseeker's Allowance also fell to 791,200, its lowest level since 2008. Average earnings in the three months to January, including bonuses, rose 1.8% compared with a year earlier. Regular pay, which excludes bonus payments, rose by 1.6%, in the same period compared with a year ago. It means earnings continue to outstrip consumer price index (CPI) inflation, which official figures showed fell to a record low of 0.3% in January. The employment figures come as Chancellor George Osborne delivers his final Budget before the general election later on Wednesday. Mr Osborne hailed the latest employment figures, claiming they marked another "economic milestone" and "confirmed a new record high employment rate, alongside a claimant count that has not been lower since 1975". However, currency markets responded less positively, with sterling falling by 0.5% against the dollar to $1.4679 and 0.65% against the euro to €1.3819. The employment rate now stands at 73.3%, the highest rate of people in work since the ONS began keeping records in 1971. The number of young people out of work, however, has stayed stubbornly high. The ONS said the number of 16 to 24-year-olds out of work fell by just 12,000 in the three months to January, to 743,000 - a rate of 16.2%. The rise in average earnings is also slower than last month. In February, the ONS said average wages including bonuses rose by 2.1% in the three months to December, compared with the same period a year earlier. Pay excluding bonuses rose by 1.7% in the three months to December. However, the ONS said the slowdown in wage rises could be largely explained by a smaller bonus payments in the period. Elsewhere within the figures, the number of self-employed people rose by 33,000 to reach 4.53 million. Mr Osborne said: "This good news is further proof that the government's long-term economic plan is working and that British families are seeing the results, with regular wages rising more than five times faster than prices." Labour's shadow work and pensions secretary, Rachel Reeves, said the fall in overall unemployment was welcome, but pointed out "working people are still £1,600 a year worse off since 2010". "After five years of David Cameron, the number of people paid less than a Living Wage has risen by 44% and nearly half of all the new jobs created have been in low-paid sectors. It's five years of Tory failure on low pay," she added. Ian Stewart, chief economist at Deloitte, said the data showed the "big picture" was one of "strong growth in full-time jobs in the private sector, record employment and the highest level of vacancies in 12 years". "A tightening labour market is bringing the long-awaited wage recovery. After falling for six years, real earnings are growing at the fastest rate since 2008." But Howard Archer, chief UK and European economist at IHS Global, said that while the chancellor would be pleased to see further solid employment growth, it was "disappointing to see that earnings growth weakened in January". He added: "While the marked fall in annual headline earnings growth to 1.8% in January from 2.4% in December was entirely due to the fact that less bonuses were paid in January than in December, it is notable that underlying annual earnings growth (which excludes bonus payments) was only stable at 1.6% in January, which is down from a peak of 1.9% in November."